Before I start the detail here but let me say thank to this guy ., I did asked his permisson to put up the photo over here. Now let get into this discussion this is a 200 amp panel from resdentil site and due this setup it is a not standard run of mill breaker box what we typically see here. This breaker box do have little odd arrangement this do have multi splitbuss in this box the upper is the main breakers area due per NEC code it will only allowed 6 throw so therefore with this set up they did have mid section that feed from one of the breaker on upper left side of breaeker box and the lower section is feeded from the breaker from upper section as well. This panel is from 60's era as I did discussed with some of the members here. As far you see the solider connecton on the bussbar as you see at the first photo I do not know if this was soildered or spotwelded one of the two. Yeah I know.,, Most of us used to see 60/100amp spitbuss panel but this is much larger in size. If you have more queston with this you can ask me or I can get ahold of Michael if more info arise. Two (2) on left side are OCP for 'Center' and 'Lower' sections. Three (3) on right side are 240/208 volt circuits. Center group of breakers appear to be 'small amperage loads. Lower group are all 120 volt loads. The 'red' marked probably indicates 'exit/egress circuit', or perhaps alarm/smokes. Frenchie types faster then me?? This is pretty simple to me. This is a late 1970's era total-electric house. These are all over the place here. The top (MAINS) section contains no more than six disconnects (six two-pole breaker spaces). One of them feeds the middle sub-section via a 60 amp breaker and another feeds the bottom sub-section. The heavy loads, like heat, A/C, range or dryer circuits are placed in the top or "main" section. Being in Michigan, near the Canadian border?, I'm assuming that there is no central A/C. The breakers on the right of the top section would be (from the top-right), water heater, dryer and range. The middle section contains 20 amp baseboard heating circuits, about 24 feet per circuit? The bottom section contains the SA and GPL circuits. Looks like Harry Homeowner might have stuck a few 120 V circuits into the middle section on the right side, but there's nothing wrong with that. I only say this since there appears to be a hardware store price tag (not the barcode label) on the top one. No big deal in my book. Those panels, single or double sub-sections are fairly common around here. I don't necessarily like them, but I don't see a problem with them either. The design is good from a professional standpoint, but the safety factor for a homeowner is questionable. Does anyone have any information about the reliability of spot-welding (?) of conductors to the middle and lower busses? Any of these ever come loose? Mike, I don't think that those are what you would consider spot welds. They are more like concentrated solder joints. I've never seen one fail in a split bus panel, in fact I've seen more main breakers burn up than any split bus panel failure. I miss them. I think that they afforded a lot of flexibility if installed properly. It was the end-user's lack of understanding that brought on their demise. That panel in the pictures was a work horse. I'll be that I installed 200 of them in their time in new home construction. The only reason that we stopped using them is that we ran out of main breaker space when separate range and ovens got popular again. 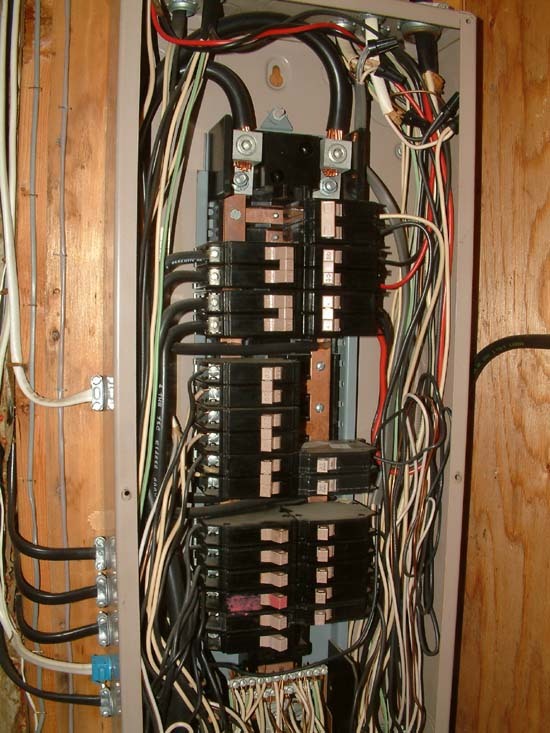 We had the heat, HWH, AC, dryer and range covered (plus the lighting main of course), but once we needed the seventh main breaker, our company switched over to main breaker panels even before they were required. Thanks for the information. I have only seen a few of these split bus panels. Regrettably, most of the ones I've seen had been altered by Harry Homeowner, who didn't understand (or care about) the six-throw rule. 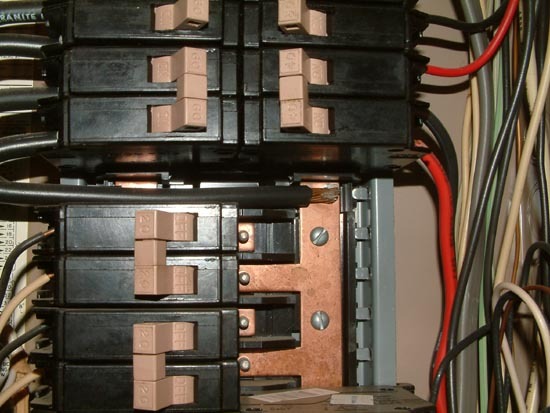 The main (top) section had the two 240 v. disconnects for the lower sections, but the rest of the main section was filled with single and tandem breakers. I remember one such panel that actually required 14 throws to turn off everything in the residence - no main disco at the meter, of course. The 6-throw rule always struck me as rather arbitrary, pointless, and rife for abuse. With the exception of legally excepted systems (fire pumps, etc), I don't see why there should ever be more than a single disconnect to shut down all power into the building. 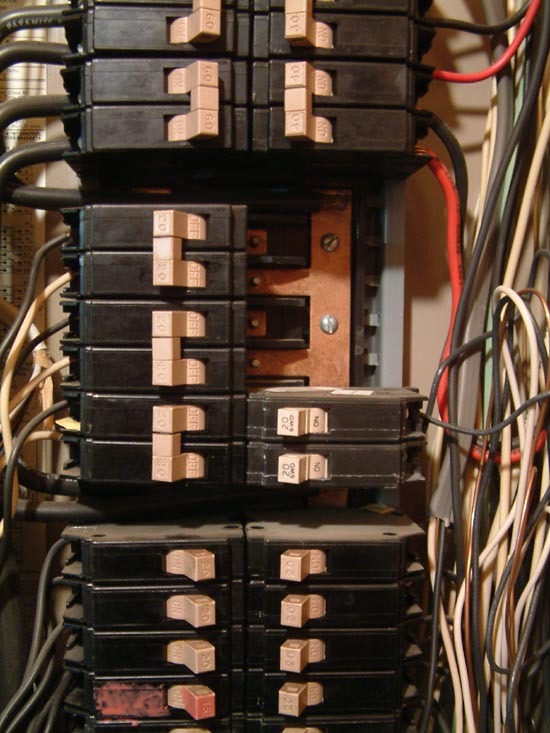 Even in buildings fed from multiple services or redudant substations, technology still allows those breakers to be easily tied together to a single EPO button. In fact, I'd argue that cases like this- where the configuration can be complex- really do need a single simple EPO for safety.